Betsy and I are very into the show Dexter right now. It’s such an original and interesting show. The problem is that we don’t have cable and so we are always a few seasons behind because we have to rely on Netflix for our Dexter fix. My cutting board looked like a crime scene. That’s the price you pay for cooking with beets I guess. It’s a price that I’m definitely willing to pay because they make for a really delicious and healthy soup. This is a simple and healthy winter soup recipe. It only has a few ingredients but the flavors from the roasted beets are delicious! 1) Slice off root tip and stem tip of three large beets and roast them in a 400 degree oven until they are tender, about an hour. 2) Slice the top off of half a head of garlic, exposing the cloves. 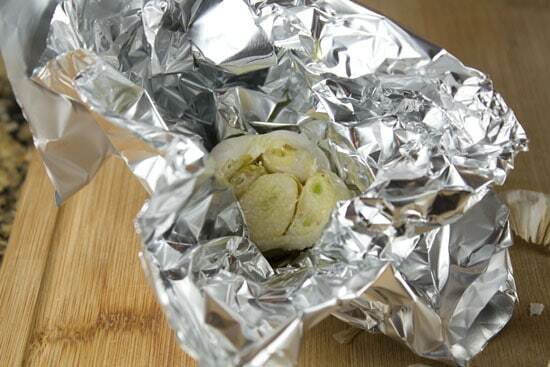 Wrap in foil, drizzle with a bit of olive oil and a pinch of salt. Roast for 30 minutes at 400 degrees. 3) Once beets are roasted, let them cool and then peel and cube them. 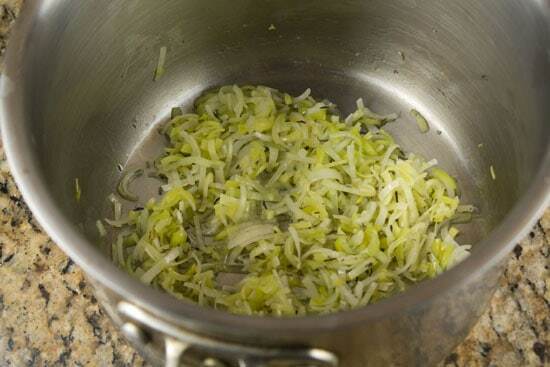 4) In a large pot, add a few tablespoons of olive oil and the sliced leek. Let cook until soft over medium heat, just a few minutes. 5) Add cubed beets and roasted garlic along with thyme and bay leaf. Add stock and bring to a simmer. Cover and simmer for 5-10 minutes. 6) Discard bay leaf and blend with a blender. 7) Add lemon juice and season with salt and pepper. Serve with lots of crusty bread. Adapted from a Whole Living recipe. This Roasted Beet Soup is not a complicated soup. The flavors are pretty straightforward and the star of the show is definitely the beets. Since there isn’t a lot of other stuff in the soup, the beet flavor is intense. Beets, when they are roasted, have a slightly sweet flavor that rocks when paired with the few other ingredients in this soup. I’ve made a more complicated beet soup before (cold borscht) and while both soups are great, I loved the simplicity of this one. One big change between that soup and this version is roasting the beets. While it does add about an hour onto your prep time, it’s totally worth it. The beet flavors get a lot more intense after roasting. You don’t have to do anything fancy to the beets before roasting them. Just chop off the stems and the root tips so they sit flat on a sheet pan. No need to wash them or anything since you’ll need to peel them later anyway. These were some big beets. Roast them at 400 degrees until they are tender, probably about an hour. This, of course, depends on how big your beets are. Mine were huge and so I only needed three of them. These were about the size of my fist! 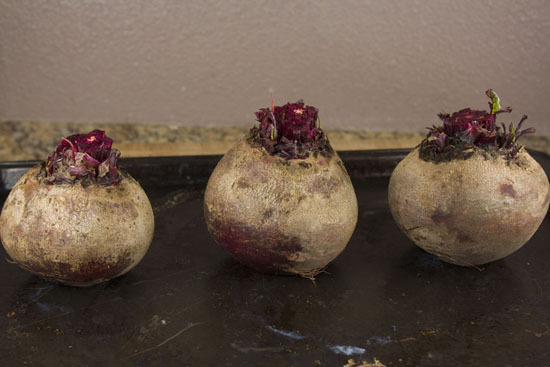 If you use smaller beets, you’ll obviously need to use more of them. I made a soup a few weeks ago that was all about roasted garlic. While this soup is focused on the beets, it also has roasted garlic in it. Not quite as much, but just enough to give it some nice flavor. I’m pretty sure that roasted garlic is one of my favorite smells in the whole world. Nothing like it. I used a half of a head of garlic and just sliced off the tip of if and then drizzled it with some olive oil and a sprinkle of salt. Wrap it in foil and roast this sucker for 30 minutes. When my beets were about half done, I just tossed it in with them for the last 30 minutes. 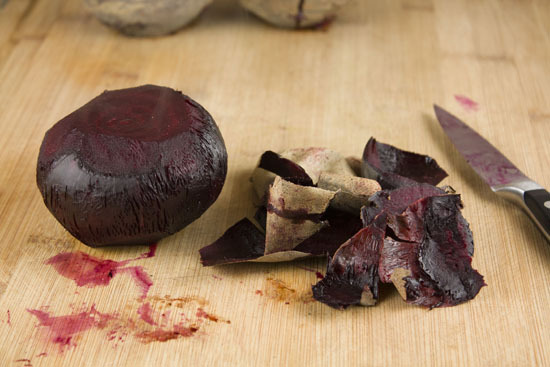 Once your beets are done roasting, let them cool for a few minutes and then get down to business. 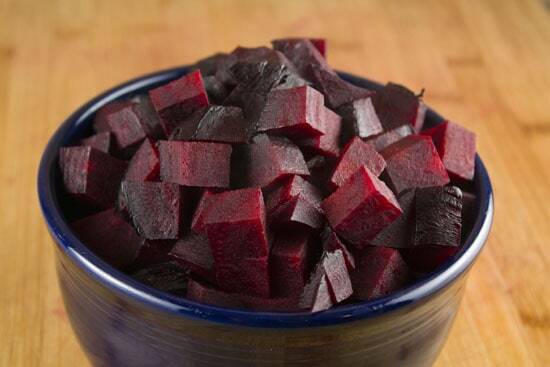 You’ll quickly understand where the phrase “beet red” comes from. This stuff will stain anything it touches. The peel on a beet is pretty thick. I’ve never been able to find a veggie peeler that can do a good job, so I always just use a paring knife to peel these guys. Once the beets are peeled, just cube them up and you’re ready to go! The hardest part of this recipe is dealing with the beets. It’s smooth sailing from here. There will be evidence of this dish. The roasted garlic is a lot easier to deal with than the beets. Once it’s done roasting, let it cool as well and then you can literally just pop the cloves out of their skins. Definitely a top ten smell for me. This soup is really easy to throw together once you have the ingredients roasted. Just add a few tablespoons of olive oil to a large pot and then throw in some sliced leeks. I guess you could use onions instead of leeks for this, but I worry that the onions would really overpower the beet flavor. Leeks are a bit more mild so they work better in my opinion. Just cook them over medium heat until they soften, probably 6-8 minutes. Then add in the beets, garlic, herbs, and stock and bring the whole thing to a simmer. 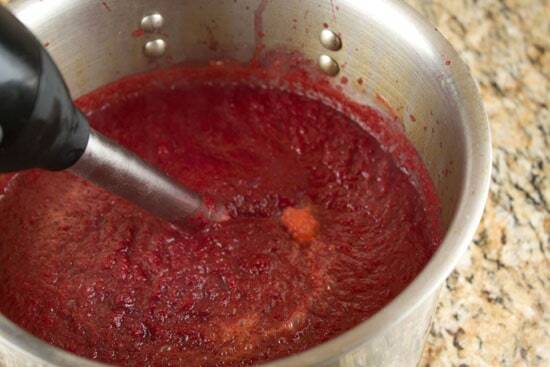 Let the soup simmer for about 10 minutes and then puree it with a stick blender. You can definitely use a normal blender as well. If you’re using a bay leaf, take it out before blending the soup. 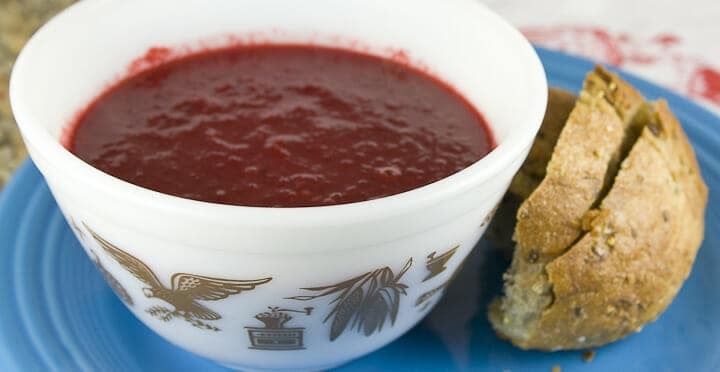 To be honest, if you don’t have a blender, you could just dice up your beets into smaller cubes and serve this soup without blending it. It would have a nice rustic feel to it. After it’s blended up, add in the fresh lemon juice and taste the soup for salt and pepper. It’ll probably need a good pinch of both, but might be okay on salt depending on the kind of stock you use. Some can be pretty salty. This soup was actually supposed to be part of a healthy cleanse thing that Betsy and I are half-trying to do. We’re failing pretty badly at it honestly. 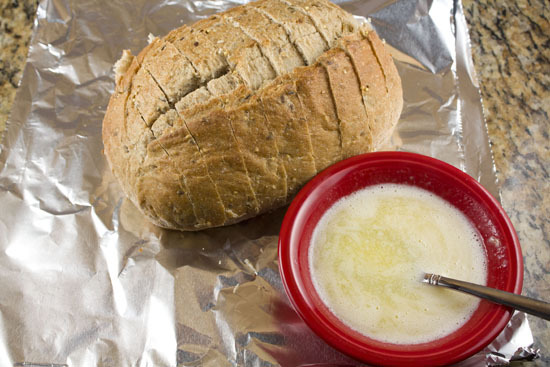 We sabotaged this meal by making a huge loaf of delicious garlic bread to serve with the soup. I just sliced up a whole wheat loaf of bread and drizzled on some butter that I melted together with a crushed clove of garlic. Then I baked it in foil for about 15 minutes while I finished the soup. The soup was totally delicious, but I would’ve had a hard time making a meal out of it without the bread. Nothing to fancy about this meal, but it’s a really great winter dish. The flavors are warming and healthy. 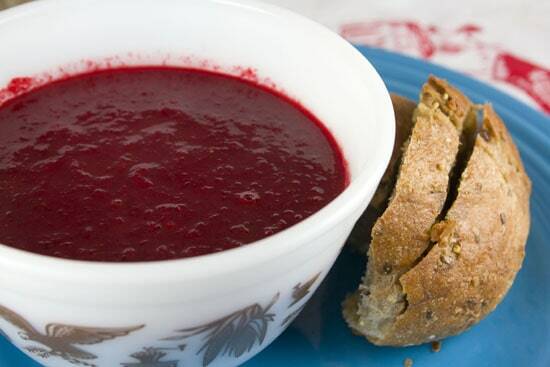 If one of your new year’s resolutions is to lose weight, eat better, or cook more, this Roasted Beet Soup should be on your meal plan soon! Happy New Year Nick! That soup looks great. I have never tried to cook with fresh beets before. This may be a stupid question but does it stain your teeth for any amount of time while you are eating it? It might be a good first course for guests, but depends upon the stain factor. Nah. I’ve never noticed that it stains teeth that badly. Definitely not as badly as red wine. If it does stain at all, it dissipates very quickly. Ha! The staining of red wine sure never stopped me from drinking it! Good comparison. It doesn’t stain teeth really, but be aware that it’s not blood in your urine. Okay, TMI. This sounds AMAZING. Beets are messy, but always worth it! No, honey, you just ate a bunch of beets last night. I eat a lot of beets, so maybe I need to “resolve” to make some borscht next week! They’re VERY good for you. Iron helps us play! #2: Do you find the texture of the soup to be “off”? Like, not smooth, but not rustic, so almost gritty? I just made squash soup that I immersion blended, and this beet soup looks to have a similar texture to what I ended up with. 2) Not at all. Thought it had a really good texture actually. Anytime you’re making soup with a root veg or gourd, you need to make sure that A) you roast or boil the veg until it’s very tender and B) you have enough stock or water to blend it well. I just started getting into Dexter myself! I can see how messy this could be, but I do love me some beets! I’ll be making this soon, I make a big batch of veggie soup about every week. I always feel like Lady MacBeth after working with beets. “Out damned spot” to my hopelessly red hands. Currently eating this soup (taking a break because I just burnt my mouth, thanks to my over eagerness to get into its deliciousness). It amazing. Loved this soup. I made it with “Love Beets'” “Freshly Cooked Beets,” which keep in the refrigerator for weeks before use.I roasted the beets etc in advance, and then I blended it the next day. I was not exact with the measuring, but I doubled the recipe, and it was delicious. I stirred fresh goat cheese into my serving, but my guests enjoyed it “straight up.” Everyone thought it was great. I will make this again!